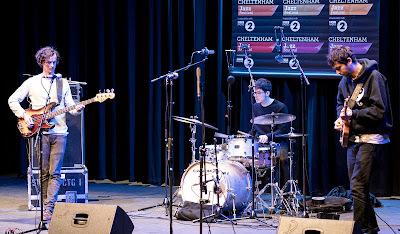 Schnellertollermeier - three surnames run together to make a band - began their Sunday lunchtime set in the Parabola Theatre with a minimalist rhythmic patter: the lightest of touches on drums, a single repeated bass note, a simple palm-muted guitar figure. It was the Swiss power trio’s quietest moment, but set a template for their set. They are interested in rhythm, executed with military precision - and underpinned by a straight four-four cymbal beat that endured for virtually the entire set - and texture, often stark. There is little concession to melodic interest, but plenty of energy, imparted by turning up the gain and the combination of punk attitude with up tempo electric sounds. The music sounds tightly arranged, with some interesting swerves and switchbacks, though repetition features too - the influence of trance-oriented electronica is strong. The hour passed agreeably enough, although the typical volume level was testing. Some electronic subtleties may have been absent as their their equipment went astray en route to Cheltenham - they had to use substitute gear assembled in the nick of time. Still, this is music I probably won’t be revisiting. Plenty of listeners enthused afterwards, but this take on jazzpunkrocktrance isn’t for me, I think, relying heavily on a very vertical approach to rhythm and rocking crescendos that ultimately became rather tiresome. I may have spent too much of my life listening to Paul Motian to appreciate the finer points of this trio’s work..
A visit to the Big Top in the afternoon brought something more traditional, including an unusually musical communal singalong that delighted the sellout audience. 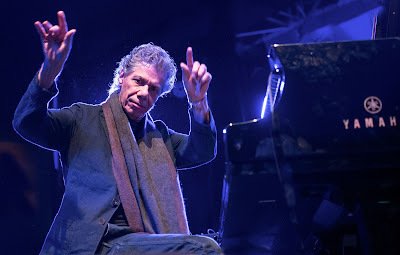 Chick Corea certainly knows how to work a crowd, and knows how to deliver enough piano trio goodness to satisfy the aficianados, too. After Corea’s own hummable 500 Miles High, we had a beautifully poised tribute to Bill Evans in Alice in Wonderland, with Evans’ chord voicings to the fore and Eddie Gomez on bass reprising his role in Evans own trio. Then came a rock solid rendition of Monk’s Work, which Gomez suggested was some kind of new Corea discovery although he played it in London five years ago. (REVIEWED HERE). Still, it prompted the bassist’s strongest solo of the show. That London visit had featured the fuller tone of Christian McBride on bass, but as here enjoyed the matchless Brian Blade on drums, almost an orchestra in his own right. His gift of goading from the drumset without dominating is a delight. and Corea matches him for sureness of touch and inventiveness. At 75, the pianist communicates an infectious enjoyment in music-making. 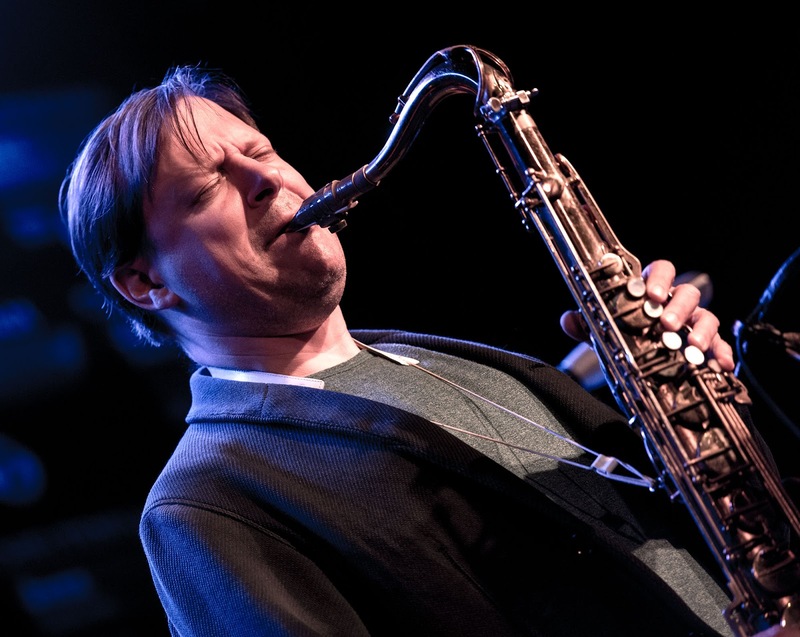 Another restlessly inventive drummer contributed mightily to the strongest Saturday set on my list, when Chris Potter’s quartet stormed the arena. Nasheet Waits, taking the chair filled by Marcus Gilmore on Potter’s new ECM recording, had sheet music to attend to, but established such a continuous rolling boil of percussion it was hard to say whether he needed it. Potter, who also sat in with Snarky Puppy, was on imperious form, building satisfying solos on every tune, and pianist David Virelles contributed equally to a fine band. The Cuban has a gift for unexpected phrasing that grabs the attention and goes along with a supple rhythmic sense that enlivens the group episodes as well as his solo excursions. I’m sure the new album is beautifully recorded, but Potter’s band has nothing to do with the dreamy Nordic-jazz stereotyping that used to crop up in attempts to define an “ECM sound”. This was roaring, virtuosic post-bop of the highest order.